The Sony Xperia Z1 is without a doubt one of the best camera phones in the market, equipped with a 20.7MP rear camera featuring Sony G Lens, the flagship smartphone from Sony is now available in Malaysia with a retail price of RM2,399 but wait, who says you need to pay for one? In conjunction with the worldwide release of the device, Sony Mobile Communications is offering consumers from around the world to stand a chance to win a unit via an online contest. 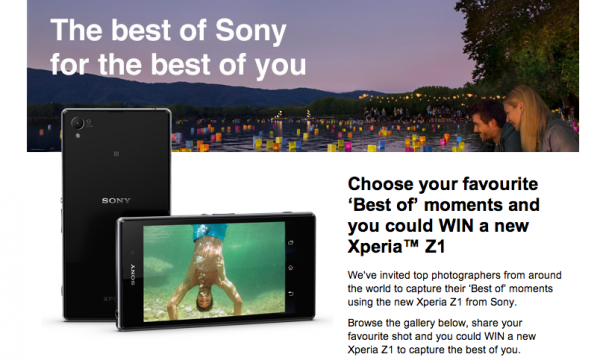 To participate, all you need to do is visit the “Best-of” photo gallery on Sony Mobile’s global Facebook page at http://apps.facebook.com/sonyxperiahub/global/best-of. The gallery showcases some of the “Best-of” moments, captured using the Xperia Z1 by some of the top photographers from around the world. All you need to do is answer a simple question on the entry form, and you will be in the running to win your own Xperia Z1. The contest is now live and will run until 10 November 2013 at 23:59 GMT. Sony will give away a total of 40 units of the Xperia Z1, one each week. Participants must be at least 18 years old and only one (1) entry per participant will be accepted. Winners will be chosen from 100 randomly selected entries and will be notified by email between 21 October 2013 and 22 November 2013. Find out more or join the contest now at Sony’s Facebook Page. Good luck.